The Talbot 8/18 was born out of necessity. By 1921 the Talbot works were idle, as demand for their expensive Edwardian-era cars evaporated. New owners, STD Motors, had an advanced four cylinder engine in their Paris factory. Designed by Louis Coatalen it featured overhead valves, three-bearing pressure-fed crankshaft, water pump and coil ignition. It was a design that would not have looked out of place in the 1950’s. Mated to a three speed gearbox, placed in an 8’1” chassis, suspended on quarter elliptic springs and clothed in a two-seater body, this gave Talbot an instant entry to the booming light- car market. Marketed initially under the Talbot-Darracq and Talbot brands the factory soon consolidated on the Talbot name. The short chassis and differential-less rear axle meant the car was suitable only for two-seater coachwork, this being sub-contracted to Vickers in Crayford, Kent in order to cope with demand. By 1926 the arrival of the mass produced Austin 7 had killed the market for low volume high-quality producers and the 8/18 was de-listed with 1800 having been made. In 1923 Talbot Chief Engineer, Georges Roesch, realised that survival depending on having a full four-seater car. He took the 8hp engine and increased the bore from 57mm to 60mm stretching capacity to 1074cc: the chassis was beefed up and extended to 9’ or 9’4”; the rear axle gained a differential and powerful brakes, sporting four shoes in each rear drum, and the good performance was maintained - Talbot had a winner on their hands. The model went through L, T and Z configurations, becoming sturdier (and heavier) each time. 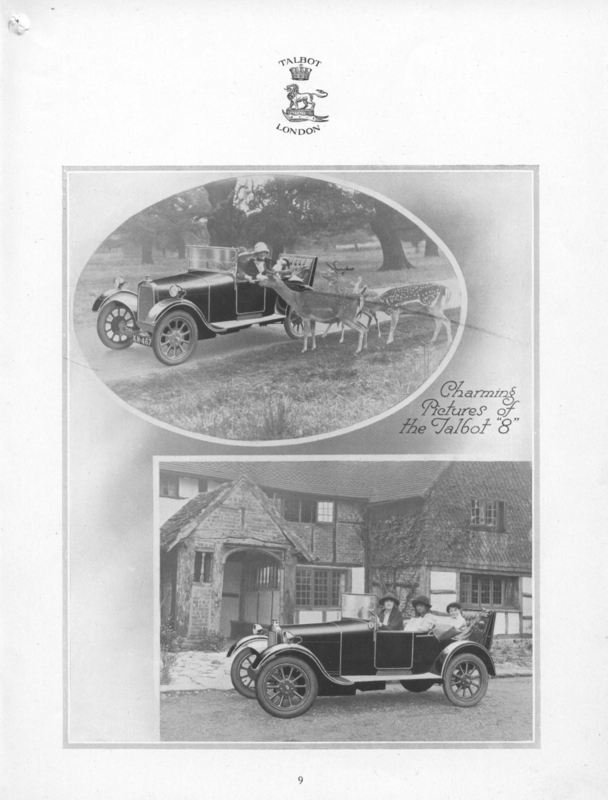 Bodies were produced by in-house coach-builder Darracq in 2-seater, 4-seater, coupe and saloon configurations. Produced at a record rate of over 1000 cars per year the model ran to a total production of 2800 by 1926. It was the most successful Talbot to date and saved the factory from certain bankruptcy. The 12/30 was produced from 1923 -1926, initially with a capacity of 1454cc, then 1612cc from 1924. It had semi-elliptic front and long cantilever rear springs in contrast to the 4-cylinder cars with their quarter-elliptics all round, but also a considerable weight penalty of almost 6cwts. Only four survivors are known. These Talbots are now regarded as one of the most refined of the 1920’s light cars, and cost no less than twice the price of the ‘Bullnose’ Morris Cowley. Their engines rev to 3000rpm and produce adequate power. Controls are light and the gearbox a pleasure to use. They are much sought-after but a rare sight on the roads – only about 50 have survived.